Unakoti in Tripura is an ancient place of worship associated with Shiva in Tripura in India. The story of the place famous for huge rock cut carvings is very interesting. Unakoti story is associated with a visit of Shiva to Kashi. Unakoti means one less than a crore (ten million). Koti means crore. Legend has it that Shiva was traveling through the area along with one crore gods and goddesses. The coterie was on their way to Kashi (Benares). They decided to spend the night at the present day Unakoti. He had asked the gods and goddesses to wake up before sunrise and proceed to Kashi. But none of the gods and goddesses woke up except for Lord Shiva. An angry Shiva then cursed the gods and goddesses to become stone images. 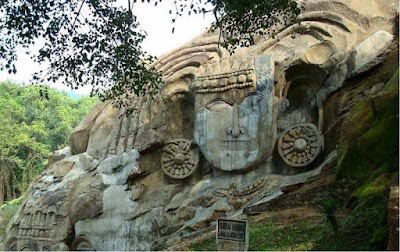 It is believed that there are 9999999 stone images and carvings in Unakoti. As Shiva had left one image is missing. Unakoti is located around 177 km from Tripura and it is around 8 km from Kailasahar. The most famous image here is of Unnakotishwara Kala Bhairava – which is about 30 feet.